I aspired to compete for many years before I sought help to make those dreams come true. I talked to a few coaches before coming across Joe at Next Level. What immediately set him apart from the others is that he gave me a game plan. He outlined everything for me and made everything make sense for a first time competitor. Along the way, he has continued to provide reasoning as to what we are doing and answers all questions I have. He has taught me how to eat to properly fuel my body and does not starve me. He also takes the time to ensure workouts are being done correctly to obtain maximum results! Everything has been tailored to my needs and what works for my body. With all that said, we have been able to completely transform my body, resulting in not only a stage-ready physique, but also an extreme boost of confidence! Together, we brought home two medals from my first show and continue to improve each and every day! I am thrilled with the progress I have experienced this far, and even more thrilled for the progression that has yet to come with Next Level!" When I first joined Next Level Bikini Team I didn’t have a clue about competing. Joe’s 19 years of experience in the industry made the learning process smooth and painless for me. Prep for my first show was absolutely incredible the whole way through. I’ve heard horror stories about cookie-cutter programs with coaches who severely under-feed (800 to 1000 calories per day!) their athletes. The plan you receive with Joe is anything but that. He recognizes that everyone is different, and truly tweaks your program to fit your individual needs. As an active duty soldier, prepping for a show came with a lot of special hurdles. Despite all of that, we landed a national qualification at my very first NPC competition. Over one year on this team and I still get excited for check-ins and changes to my program! I highly recommend his services to anyone who is serious about getting into the best shape of their lives, whether they wish to compete or not. Our percentages are the best out there, and numbers don’t lie!" Prepping with Next Level has been unlike any other training I have ever received. Joe has shown me how enjoyable prep can be given the right coach and plan. Everything from my diet to my cardio plan is dialed in for my specific needs so I am never consuming too much or too little or spending endless hours doing cardio every week. I highly recommend working with Next Level to achieve any fitness goal!" I trained with Joe for just over a year, and saw more change in my body than I have in the whole 4 plus years I trained without him. I did less than half the cardio I used to, and ate almost triple the amount of carbs. Joe takes time with you and really cares about his clients! It's not just a cookie cutter meal and training plan. This isn't a one size fits all. He takes time to get to know his girls and makes sure we are set up on the proper meal plans for our bodies and goals. Joe is very knowledgeable and is about doing things the right healthy way! I highly recommend Next Level to every bikini girl!!! I'm telling you you won't be disappointed!!!" I’ve been competing for three years and training and eating well for as long as I can remember. My results somehow always fell short in achieving the physique I really wanted. It wasn’t until Joe carefully evaluated what my body really needed in order to give me the results I was looking for. He perfected every aspect of my routine from training and proper form/technique to nutrition and timing/macros to supplementation to digestive health to sleep and everything in between. No piece of the puzzle gets left out. He will give you every tool you need to accomplish your goals and hold you accountable to make sure you’re progressing. It takes someone with extensive knowledge, training, and experience to be able to coach athletes like Joe does. We sculpted a physique that I never thought I could achieve. In the time I have been with Joe I have learned a great deal about myself, my body, and all of the things that go into truly achieving results. I have never been happier and feel so fortunate to be a part of such an elite team of athletes!" "Coach Joe is AWESOME to work with! I prepped with Next Level Bikini Team for almost two years. Through working with NLPT I’ve been able to reach personal fitness goals and create healthy lifestyle habits. Coach Joe is very knowledgeable and awesome to work with!" My main goal when I came to Joe was to qualify for Canadian Nationals. Not only did I qualify for nationals but I went to nationals and got 4th! This brought me to IFBB North Americans where I placed second, and now I am going to be one of only 6 girls in my country selected to represent Team Canada at the IFBB Worlds in another attempt at my pro card. That is three national level shows this year! I can honestly say with my whole heart that I would not be where I am today without the help and support of my coach. I appreciate everyday that he saw potential in me and was willing to mentor and coach me to be a national level competitor. He never let me settle my goals for a national level invitation but has me now shooting for a pro card. This is what a coach is meant to do, look out for your health and see your potential- Joe did both and I am forever grateful." I joined Next Level Bikini Prep in May 2015, close to the end of my senior year of high school. I researched other coaches and teams with a goal to find someone who had a healthier approach and truly tailored each program. Not just some “cookie cutter/horror story” approach, but a plan where I would really see results. Being a part of Next Level and having Joe as my coach, I have learned so much about what types of training and nutrition work best for my body to reach the optimal results and then some. We have not let my younger age and lack of muscle maturity slow us down from bringing home trophies and national qualifications, even when faced against ladies who have been competing much longer than I have. Joe’s experience and guidance has helped me reach results I didn’t think were possible. I recommend training with Next Level to anyone serious about getting into the best shape of their life!" When I decided to do a provincial level show, I picked Next Level because I liked the physiques of the girls on the team and knew Joe would help me achieve that. All the meal plans and workouts are personalized and they make sure you are ready to hit the stage by helping in perfecting your posing. Even though he is 3000 miles away, I felt like Joe was there every step of the way. I followed the plan perfectly (which isn’t hard since the foods are amazing) and the physique I achieved was beyond what I thought was possible. I can’t wait to see where Next Level is going to take me next." Joe is knowledgeable, passionate, and unlike many coaches out there, he takes the time to educate his clients. He doesn’t just tell you what to do and bark orders, but rather he explains the reasoning behind things and I love that! He empowers you and encourages you to be aware and active in your own health. He promotes healthy weight loss, and most importantly, healthy competition prep. He doesn’t starve you. He doesn’t prescribe excessive cardio. You don’t eat sticks and berries and get by on 700 calories per day with no carbs. You eat. REAL food. He doesn’t believe in excessive cardio and has old school philosophies on lifting…and they WORK. Joe is the real deal, and with so many coaches who take no mind to the havoc they are causing to their clients metabolisms, Joe stands out like a beacon in the night." We went over everything about stage presence, from my suit color to my unique routine, to call outs and even some 'tricks of the trade' that only a seasoned bikini competitor would know. Long story short, this chick rocks on so many levels and she's a great coach!" Coach Joe isn’t the type of trainer that creates a program with the philosophy of throwing everything at the wall and seeing what sticks. 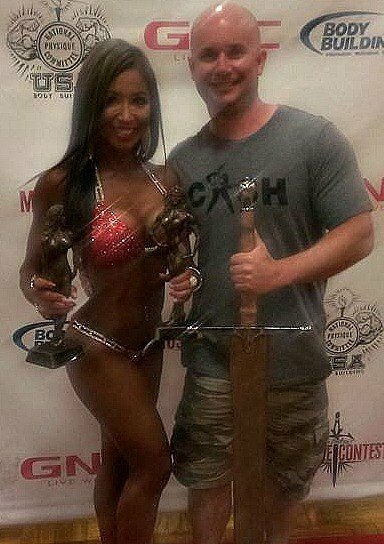 He is thoughtful, purposeful and regimented when creating your program and I can confidently say that this approach not only helped me bring home a few trophies (including becoming Nationally Qualified by my second NPC bikini competition) but, most importantly, helped me develop a much healthier relationship with food AND the treadmill. I firmly believe that my success story is because Coach Joe provided me with a truly personalized program that nurtured my unique circumstances and allowed me the room for real learning versus unsustainable fast results. We’re now in “improvement season” and I look forward to making even greater gains in my health and physique!" "CoachManJoe; (coach•man•joe), noun/- an extraordinary personal trainer of tremendous versatility, intelligence, and discipline who is hilarious, kind, and genuine. The only one of its kind and a blessing from God in the fitness world. I had been following NLPT for a bit on Instagram, because competing was an inspiration of mine and all the NLPT girls looked amazing! After deciding to do my first show, and hire a coach, I applied with NLPT. My application was viewed and Coach Joe reached out to me very soon! I was so excited that he was able to take me on! His communication and work is very detailed, thorough and he is very helpful answering all of the questions and concerns you have. I can attest because I felt so annoying asking 100s of questions! Not only is he a great coach, providing you education and exactly what you need for training, and diet, he is also funny! Working with Cherish for posing is an absolute pleasure as well. She is so sweet, helpful and EMPOWERING. Coach Joe and NLPT helped me achieve an amazing physique, and goal for my first show, taking 1st in all my classes, winning the overall earning my natural pro card! Thank you Joe!" Learn about our Online Coaching Programs! You will receive ALL the details via email, and can reply to chat with me directly. BONUS: Free bikini prep tips to your inbox!